A giant slug and a smoking skull with a birds nest carved out of it. How do these things connect? At the back, apparently. Life is Beautiful is just a couple months away, so let’s take another look at one of our favorite pieces of Las Vegas street art. Is a slug an invertebrate if it has a skull for a shell? Why is the skull smoking? What’s with the birds nest? Honestly, none of that matters. 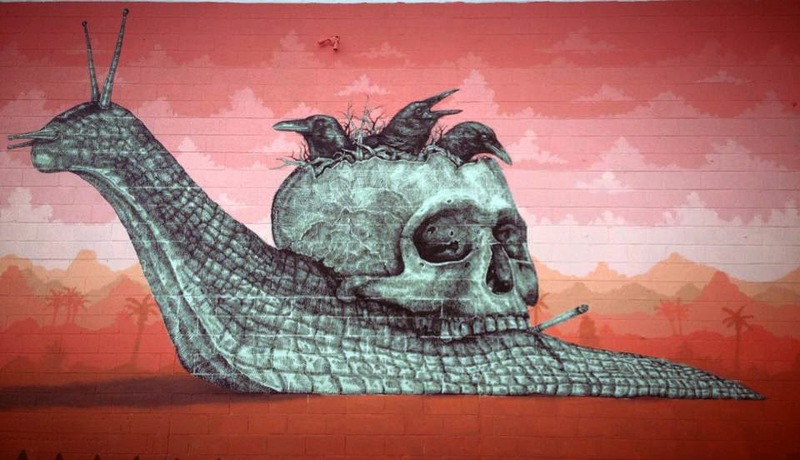 This is one of the most interesting pieces of Las Vegas street art we’ve ever seen. Puerto Rican artist Alexis Diaz painted a detailed rendition of a snail with a skull for a shell. Because he’s known for his depiction of mid-metamorphosis creatures and hybrid animals, it should come as no surprise that his gift to Life is Beautiful 2013 was nothing short of that—in fact, it was more. To achieve this level of detail, Diaz put a lot of time into it. It’s from afar that the image comes to life as a living, breathing piece. The process of creating this Las Vegas street art involves thousands of tiny brush strokes. Shadows and highlights come out perfectly in a well thought out, thoroughly painted piece. The whole process took more than a week. The background of the image is a contrasting desert landscape composed of different shades of red. It’s easy to overlook certain details like the bird’s nest coming out the top or the cigarette in the skull’s mouth. It’s truly amazing the amount of detail and work that goes into some of the Las Vegas street art we see, and Alexis Diaz’s skull and snail hybrid is definitely no exception. What if I told you there’s a way to see all these pieces of Las Vegas street art while getting big discounts on drinks? The Vegas Pub Crawler is a one-of-a-kind experience only found in DTLV, involving you and at least 14 others riding the Pub Crawler “bike.” Book your Downtown Las Vegas art and alcohol tour today.